I was on a chalkboard kick a while ago and busted out several different chalkboards in fun vintage frames of all sizes. I did this mainly to make various signs to decorate my house and I also sold some. The one that I posted about previously was my large vintage chalkboard that I put over our bed in the master bedroom. 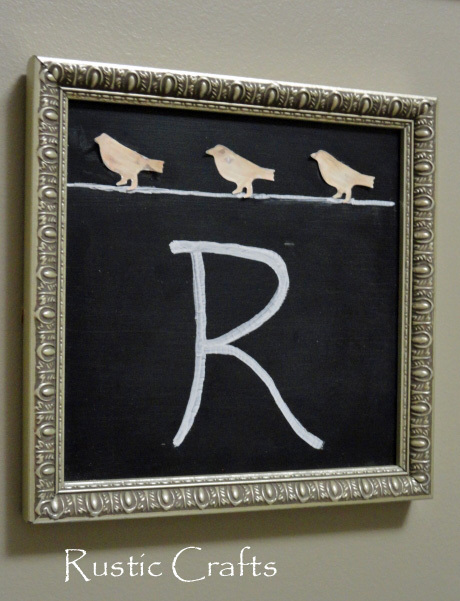 However, I never did anything with my small monogram chalkboard sign so I am going to tell you about that now. I had picked up the Queensign this past summer at a fun shop up in Northern Michigan. Actually, my husband picked it up for me….he calls me queen and figured it was perfect for me! I love it! I call him……….Chuckie Poopster! And, there is a fun story behind that, which I may share at some point. Anyway, to further make the wall all about me, I decided to hang my monogram chalkboard right under my queen sign. In case you haven’t figured it out, the R stands for Renee! 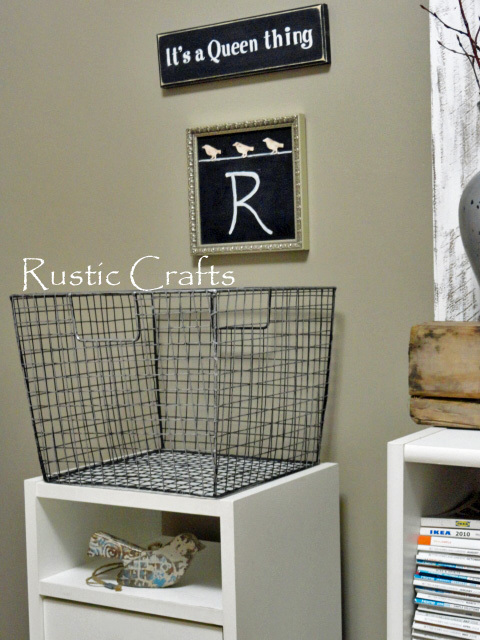 I also just bought the industrial looking wire basket, which I need to fill with something…..I’m thinking neutral but with texture…we shall see! The little cupboard, it is setting on, is something I want to eventually upscale so I will be revealing that later. 1. First, I took the glass out of the picture frame and painted it with about three coats of brush on black chalkboard paint. When the paint had cured for a full 24 hours, I then reinserted the glass into the frame. 2. I used a chalk marker to hand write my initial and then used a ruler to draw a straight line across the top to act as the “wire” for the birds. **Tip – I just read that you can use Mr Clean Magic Eraser to erase chalk marker from a chalk board with ease. 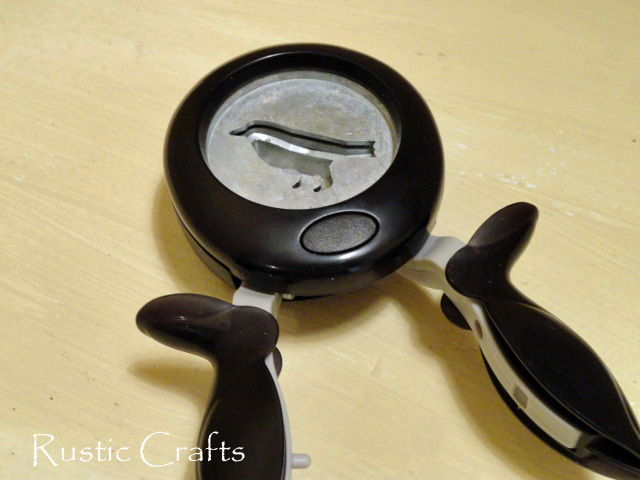 3, I used this bird punch that I had purchased from Jo-ann to cut out my birds from the tin of a coke can. First I cut the top and bottom off the can with tin snips and then just cut the side of the cylinder straight through with sharp scissors. I flattened the tin real good before inserting it into the punch and it worked like a charm! 4. Next, I painted the birds with acrylic paint and attached them to my frame when they were dry. I used E6000 craft glue but any good tacky glue would probably work just fine. Now, as I was going through my craft room this weekend and sifting through all of my goodies, I came across something that I had purchased this summer. It has nothing to do with framed chalkboards, although it could I suppose. I have been racking my brain on what I should do with it. Right now I only have one but know where I can get more but will probably have to wait until shops open up this summer. It’s an old fishing net float! 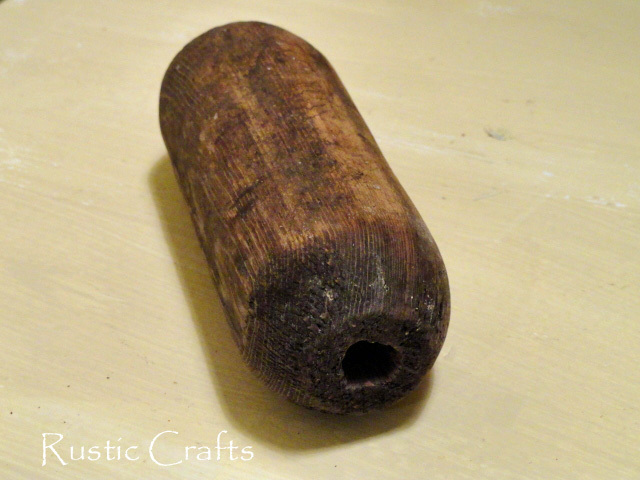 The dimensions are only about six inches long by an inch and a half in width. Can you help me with this dilemma? 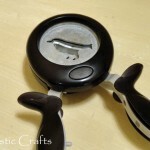 The bird punch is a really neat tool. I’ve never seen one of those before. I’m not sure what to do with the float, though! Hi Kim! When I bought the float, I had no idea what I would do with it which is why I only bought one. I felt like, and still do, something would come to me because it is just so rustic. However, it’s just not happening yet! One of these days, a light bulb will go off though! Silly me thought the R was for Ravens, lol. Yikes on your boat float thingy. The only idea thats coming thru my thick brain is a body part. I’ve seen some awesome mixed media type dolls lately. Like China Doll heads with coffee pot or clock bodies. If I can refind the links, I’ll bring them back to you. Hey! That’s a great thought Tee! Or, maybe I could make it into some primitive looking owl with the float as the main body part…I love birds! You’ve got me thinking! Hi Renee. The first thing I thought of with the float was legs. Use maybe 3 or four to create a leg for some statue-like bird sculpture maybe? Herons have kinda knobby legs and stand quite tall.